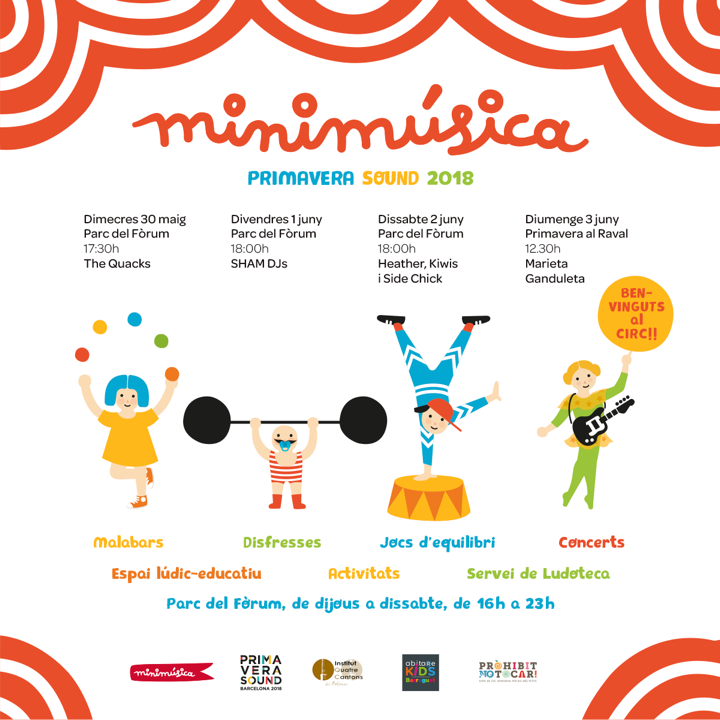 For yet another year minimúsica collaborates with Primavera Sound to bring children closer to quality modern music through the opportunity to live an interactive experience with artists from the line up. The minimúsica area in the Parc del Fòrum is up and running from Thursday to Saturday from 16:00 to 23:00 and has several services that cover families’ main needs (baby changing facilities, rest areas, protective earphones are handed out, adapted toilets…) and a free play area with qualified monitors. Also, as every year, there will be several concerts. On Wednesday at 18:00 The Quacks, a rock band formed by the students from the Institut Quatre Cantons will play. On Friday at 18:00 there will be a hip hop class with the young DJs Rubén Juanez and Miquel Pla. And on Saturday from the same time there will be a miniconcert by Heather, Kiwis and Side Chick, three bands which are representative of the underground scene in our city.